He wasn’t sure what to think of it at first. He curiously watched a purple spoon coming towards him with a heap of something creamy. I opened my mouth wide in the hopes that he would mimic me. 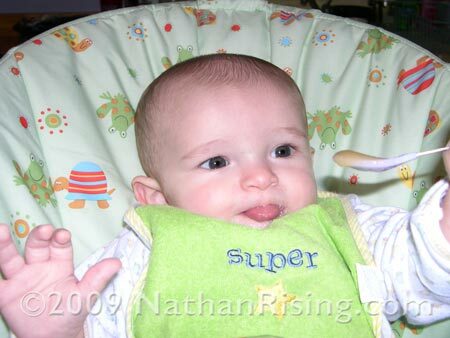 He did, so I zoomed the applesauce-laden spoon into his awaiting mouth. His initial reaction was shock, like what did she just feed me? Then his expression looked pained, like I don’t think I like this idea one bit. Why must I eat this? WHY? He spit most of his first few mouthfuls back out. It mostly dribbled down his chin, falling nicely onto the bib. 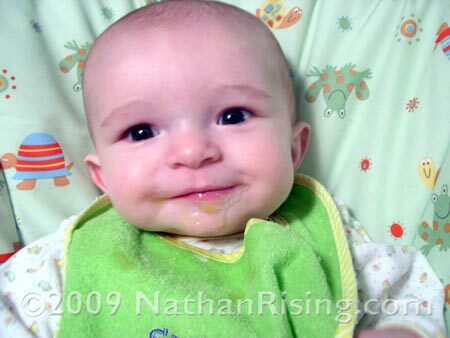 Yeah, I know… enjoy this while I can because sooner or later, food won’t be dribbling nicely down his chin. It’s going to be in his hair, on the walls, in my hair… Believe me, I am savoring this time while I can before all the mayhem ensues. 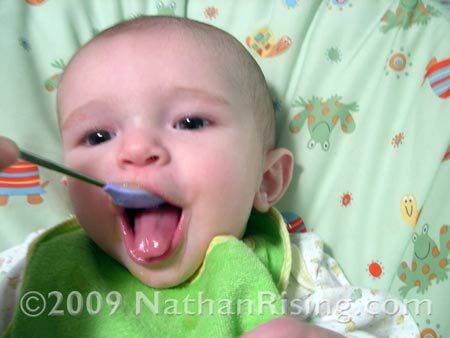 So then, after a few more bites, he decided this new non-milk substance wasn’t so bad after all. He heartily scarfed some more down, looking pensive and more like a taster at a wine gallery than a baby eating applesauce. His brows furrowed and his eyes narrowed slightly as he gazed into the distance, thinking about something clever I’m sure, while slowly turning the applesauce in his mouth. It was almost as if he was deconstructing it… Ok, so this isn’t my milk, but it tastes like something I know. What is this taste? Then he started opening his mouth wide while flapping his hands in the air, making bleating sounds to let me know he definitely liked this new non-milk substance. 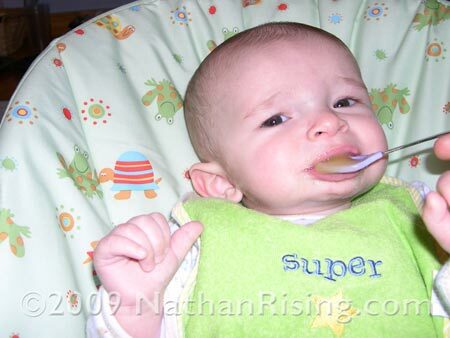 He heartily consumed more of his applesauce. When he was done, he gave us a huge smile while a content look poured from his eyes. He sighed dreamily and appeared to contemplate this new experience. We’re hoping he will have a diverse pallet and will enjoy the many new foods coming his way.